Front Porch Friday: Meet Marissa Henley! Happy Friday everyone! I am so thrilled to introduce to you a woman who has not only overcome great obstacles in her life, but a woman who is passionate about using her struggles to love on and minister to others. In her book Loving Your Friend Through Cancer, Marissa Henley gives us a simple, direct, and incredibly helpful guide for how to best help our friend who is going through cancer (or even any major health issue really). Based on her first hand experiences she opens herself up and gives us an insider’s view of what this journey is like. Each chapter contains action items to consider and practical, real life ways you can help based upon your relationship circle with your friend. It gives us a peak inside the journey that our loved one is going through. This book is the cure for the “I don’t know what to say or do” feeling! What an empowering tool to have in your pocket in a situation where things are just plain hard. Marissa leads us through a Biblical journey of what God thinks about suffering and how we can pray for our friend. I can not say enough about how encouraging and empowering this books was to me! Because of this book I now feel so much more prepared and capable to be a true friend and resource to someone I meet fighting the battle of cancer. This book will remain a reference for me when those times occur in life, and I will refer to it often to make sure I am being the best support system I can be. If you have a friend or family member fighting cancer this book is an absolute must read! It will change the way you relate to that person in a way that will lead you both to a closer and more intimate relationship with each other and with Christ. Find out more by checking out our interview below. Loving Your Friend Through Cancer is a friend’s guide to the experience of having cancer and how they can help. When our friends endure difficult situations, we all struggle with what to say, what not to say, and how to best support them. I’ve seen that friends who are well-informed are able to more confidently and compassionately minister to their friends with cancer. That’s why I wrote this book, which is based on my experience as a cancer survivor and friend to women with cancer. The ideas had been percolating in my mind for years, and I’d written several blog posts on the subject. When I started intentionally writing for the book, the first draft took about 4 months. I spent about another 3 months editing and revising, and an additional month getting it ready to print. My favorite part was writing about all the specific ways my friends supported me when I had cancer. My friends are the best! I’m thankful to be able to showcase their kindness so that others can learn from their example. The biggest challenge was finding time to write and being able to write in short increments of time. I have three kids, and th ey attend a university-model school, which means they are at school two days a week and schooling at home three days a week. So my kid-free time is very limited! I wrote most of the book in the hour and a half each week that my kids are at piano lessons. I would drop them off at their lessons, dash to their nearest coffee shop, and write as much as I could before picking them up! I hope my readers will walk away with a better understanding of the needs of their friend with cancer and a plan to support her well. I know many are eager to help and provide the right type of support, and I hope this practical information will help them to come alongside their friend and minister to her. I’ve even included a worksheet in the back of the book (and on my website) to help readers take the information from the book and apply it to their friend’s unique situation. I would have researched book formats earlier in the process. The book is self-published on Amazon, and I planned to hire someone online to format the book for paperback and Kindle. But when I hired two different people and both did unacceptable work, I ended up formatting the paperback version myself. I sat at my desk with books spread out everywhere, measuring margins, looking at fonts, and trying to figure it all out. I wish I had been better prepared and organized when we got to that step. Find a community of writers who are more advanced than you, whether it’s a local or online community. There is so much information out there for growing writers, you just need to take the time to find it. And be teachable. Realize that you don’t know everything, and there’s always something more to learn about writing! I love Joni Eareckson Tada and Nancy Guthrie, because both of them write from their experience of suffering, but also with the certainty of God’s character and His promises. The Hiding Place by Corrie Ten Boom is one of my favorite books ever. Her courage and trust in the Lord inspires me to face an unknown future without fear. When my kids were little, I blogged along with most of the mommy world, but it was just a hobby. I liked to share lessons that God was teaching me, but I didn’t consider myself to be a writer. When I was diagnosed with cancer, I blogged through the entire experience. I heard from so many people that they were strengthened and encouraged by my words during that time. That’s when I started to see that God could use my writing for His glory and the good of His people. Sleep! Play Mario Kart and four-square with my kids, have coffee with friends, and enjoy a nice dinner out with my husband. I also love to travel with my family. I wanted to be a child psychologist. But after graduating from college and realizing how many more years of school were required, I moved on to Plan B.
I used to like jokes, but my kids tell so many that don’t make sense, that I’m not sure I know any real jokes anymore! No point. I’ve got better things to do! My hope as a writer is that others will benefit from my words. 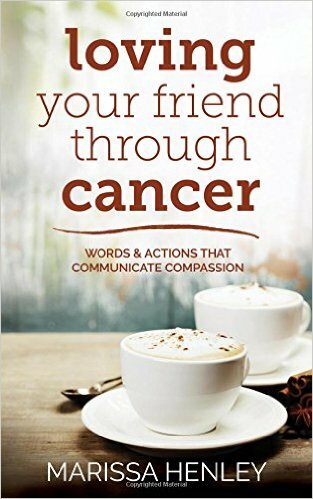 I hope you find this book to be a useful tool as you love your friend with cancer. And I’d love to connect with you on social media and hear what you think of it! Amazon.com. It’s available in paperback or on Kindle . I’d love for you to visit me at www.marissahenley.com. I’m on Facebook at facebook.com/marissalhenley and on Twitter at @marissahenley. Stop by and say hello! I loved meeting Marissa and learning about her very important book. Cancer will affect everyone of us somehow unfortunately. But yay for brave women like Marissa who share her story! I just wanted to add that a great group of writers to be apart of (in response to her advice) is Word Weavers International. We’re all about community, critique, and conferences. Word-weavers.com. Thank you Andy! I will check out that group.